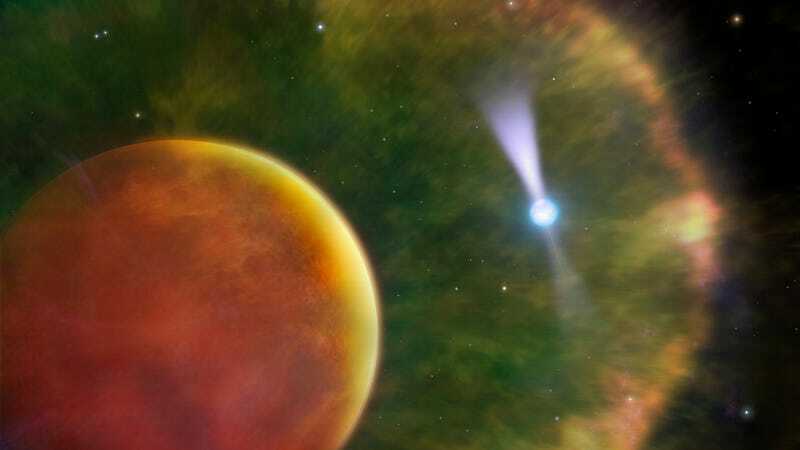 An artist’s impression of a brown dwarf orbiting a pulsar. Thanks to a quirk of astrophysics, astronomers were able to observe features just tens of kilometers apart near a spinning neutron star located 6,500 light-years away from Earth. This is like using a telescope in your backyard to see DNA strands on the moon. Scientists have studied the “black widow pulsar” for several decades, and it got its name because it’s thought that the pulsar, a small neutron star, is slowly killing its brown dwarf companion. But that very companion made it possible for astronomers to perform the incredible measurement, thanks to the way its mass magnifies the pulsar’s light. The physicists, from the University of Toronto, made their new observations using more than nine hours of data taken between June 13 and 16, 2014, at the Arecibo Observatory in Puerto Rico. They were looking for extremely bright pulses from the pulsar, which is a neutron star only a few kilometers across but more massive than our sun. 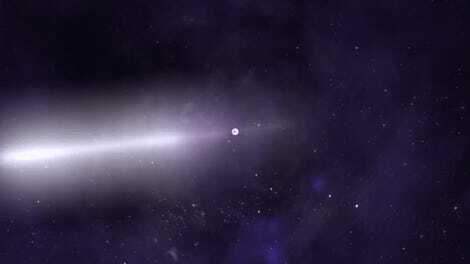 Pulsars’ distinctive quality is that they spin rapidly, beaming out radiation like a lighthouse. The team found what they were looking for, with a catch: The brightening corresponded with eclipses from the brown dwarf companion. It appeared that gas surrounding the brown dwarf, which is basically a small, cool star (or very large, hot planet), was acting like a magnifying glass passing in front of the pulsar, allowing the researchers to make out features around the star some 20 kilometers apart. Unfortunately for us, their observations are in the form of data, not a colorized and processed image, so there’s nothing for us to look at. It’s not like they can make a map of the area surrounding the pulsar, yet—though it’s the direction they’d like to take the research, according to the paper published in Nature. That would require a better understanding of how the brown dwarf lenses the pulsar. It may also help the astronomers understand the ultimate fate of these pulsar-brown dwarf systems. Obviously, there’s more work to do, but other scientists not involved with the study are excited. “Plasma lensing might allow astronomers to peer deeper into the Universe than would otherwise be possible,” Jason Hessels, astronomer at the Netherlands Institute for Radio Astronomy, wrote in a Nature commentary. Perhaps the lens will one day help astronomers understand the mystery of fast radio bursts, too. So, thanks for your help, brown dwarf. Sorry you’re being destroyed.